DHAKA: Bangladeshi forces killed four suspected Islamist extremists during raids near Dhaka Saturday, security officials said, the latest clashes in the country's ongoing crackdown on militants. Police have conducted a series of raids on suspected militant hideouts since extremists stormed a posh Dhaka cafe in July and slaughtered 22 mostly foreign hostages. The elite Rapid Action Battalion launched two separate operations Saturday after being tipped off about the presence of Islamist extremists in a building in Gazipur, just outside Dhaka, and a three-storey structure in the northern district of Tangail. "Two extremists were shot dead during a gunfight with the RAB in Gazipur. Weapons and explosives have been recovered," RAB spokesman Mufti Mahmud Khan told AFP. Two more suspected extremists were killed after RAB forces raided another building in Tangail, local RAB chief Mohiuddin Faruqe told AFP. "They fired at our officers suddenly as we raided their hideout. We fired back and two extremists were shot dead," he said, adding that two RAB officers were also injured during the raid. The RAB did not elaborate on the operations and there was no immediate comment about what group the gunmen were affiliated with. Private television broadcaster Jamuna TV said the RAB launched the raid in Gazipur after receiving intelligence that the "Dhaka coordinator" of the banned Islamist extremist group Jamayetul Mujahideen Bangladesh (JMB) was at the hideout. It remained unclear whether the extremist leader was among the dead. The Islamic State group claimed responsibility for the July 1 attack on the upscale cafe in Dhaka, posting pictures of the attackers holding IS flags online. 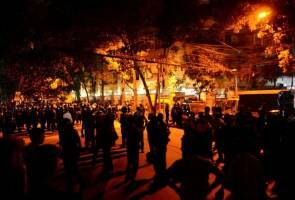 However, Bangladesh officials have rejected the claims, saying the JMB led by a Canadian citizen of Bangladesh origin, Tamim Chowdhury, was responsible for the massacre. In August police shot Chowdhury dead along with two of his associates after they stormed an extremist hideout in Narayanganj city near Dhaka. Since the cafe carnage, Bangladeshi security forces have killed at least 32 suspected Islamist militants, including a US citizen of Bangladesh descent. Long dormant after their top leaders were executed in March 2007, the JMB has recently regrouped with young, university-educated extremists taking the helm. Bangladesh has been reeling from a deadly wave of attacks in the last three years, including on foreigners, rights activists and members of the country's religious minorities.